The Institute for Justice and Reconciliation[IJR], the Dullah Omar Institute [DOI], the Public Service Accountability Monitor [PSAM], the Parliamentary Monitoring Group[PMG] and a growing number of civil society organisations have noted with serious concern the recent Protest Suicide of Lennox MzuhleliGarane, Section Manager: Multilateral Relations in International Relations and Protocol Division of Parliament of the Republic of South Africa. Mr. Garane died by Protest Suicide in his office on the Parliament Precinct on 14 September 2018. We wish to extend our sincere condolences to the Garane family for their tragic loss. Lennox Garane, a senior public sector manager, spent 30 years working in developmental organisations, including Kagiso Trust, the National Development Agency, the Development Bank of South Africa, and the Parliament of RSA. Lennox Garane’s final wish was to draw attention to the systemic abuse of power within the Parliament Administration, and its devastating consequences for the institution and South Africa. Sithembiso Garane, eldest son of Lennox Garane on behalf of the Garane Family. We have received an open letter of support and a briefing from a collective of former managers of the Administration of the Parliament who are united in expressing support to the family of Lennox Garane and are willing to testify to their direct experience of the toxic workplace environment in the Parliament Administration during the 5thDemocratic Parliament. Their collective experience, together with the substantial evidence of abuse of power outlined in Parliament’s Independent Audit report of 2017, which is a matter of public and court record, points to a systemic problem. 1. The Public Service Commission report on the circumstances leading up to Mr. Garane’s death to be made public. 2. The Executive Authority, the Secretaries to Parliament and the senior managers, where found to be responsible for abuse of power within the Administration, to be held to account. 3. An urgent legislative and institutional review of oversight and accountability statutes and mechanisms for the Parliament Administration as a priority for the 6thDemocratic Parliament. The IJR and DOI will be convening an urgent Forum on Accountability of the Parliament Administration[FAPA] for civil society and the media on 22 January at the offices of the Institute for Justice and Reconciliation to develop a civil society approach to Parliament Administration Accountability. The5thDemocratic Parliamentis coming to an end within the next three months. The6thDemocratic Parliamentwill be installed by June 2019. The legacy to be bequeathed to the new Parliament is tainted by a decade of State Capture. To make sure that the same issues that bedeviled the 5thDemocratic Parliament are addressed in as a priority of the 6thDemocratic Parliament we intend to prepare a civil society report on the issues raised in the forum. We hope to be joined by a broad coalition of CSO and stakeholders in this important national quest to fix our Parliament. The forum will include representatives from civil society organisations and the media to share our experiences and provide public policy experts and social justice activists in the field of accountability the Constitution and oversight with a platform to comment on the serious challenges facing the Parliamentary Administration in the wake of Lennox Garane’s death by Protest Suicide, and its impact on the country’s state of governance. The preamble to the Constitution is the founding vision of the Democratic South Africa. Notable persons, civil society organisations, public policy experts; social justice activists working in the field of public accountability and the Constitution are invited to participate in the forum to discuss the crisis in the Parliament Administration and its national consequences. The Parliamentary Gallery Association [PGA] is invited to reflect on its role in covering the Administration. Media are welcome to attend the Forum. The Garane family and former managers will share testimony of abuse of power and present their case for the public interest matter. A press conference will be held at 16:00 where the spokespersons of the convening organisations, representatives of the Garane Family and former Managers of Parliament will take questions on the record. Their circumstances were not the same but both shared the stage of fame for being outstanding achievers in matric last year. Basic Education Minister Angie Motshekga recognised David Mark Dodkins (18) and Avukile Nkayi (19) for their efforts during the 2018 matric results announcement at Vodaworld in Midrand, Gauteng, last Thursday. A determined Dodkins passed with flying colours in maths and physical science at well-resourced Bergsig High School in the North West. As a result, Motshekga awarded him for being a top achiever nationally in both subjects. On the other hand, Nkayi came in second place nationally and passed at the poorly resourced Nyanga Senior Secondary School in Ngcobo, Eastern Cape. 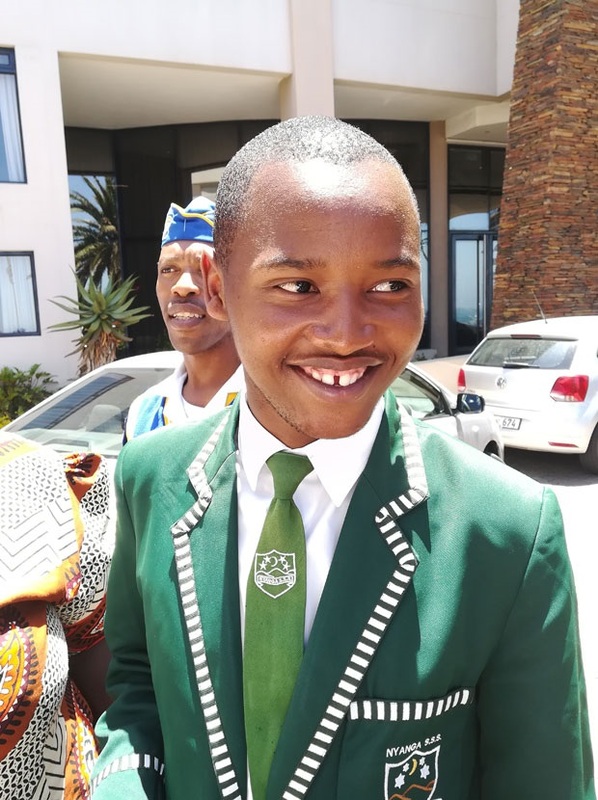 Nkayi also was crowned as the overall top achiever in the Eastern Cape during a similar ceremony last Friday, beating his fellow counterparts from well-resourced schools in that province. Speaking to City Press, Dodkins said his parents had always supported him. He said by grade 12 his parents had already ingrained in him the discipline needed to concentrate on his studies. “Also, my parents assisted me greatly by always trying to be quiet when I was busy studying,” Dodkins said. Dodkins received an award as an overall top achiever in the North West and for coming top in maths and physical science. He will be studying towards a degree in actuarial and financial mathematics at the University of Pretoria. From a disadvantaged background and having only been supported through maths camp funded by provincial ANC leader Oscar Mabuyane who is also the province’s MEC for finance, Nkayi stole the limelight nationally and provincially by passing with seven distinctions. • 89% in IsiXhosa HL. Nkayi said he was thrilled about his achievement. He overcame the odds with the help of his proud mother Thembeka Nkayi, a street hawker in Elliot who sells fruit and meat. “My biggest motivation was the situation at home. We are poor and disadvantaged and that has always inspired me to work harder. I come from a disadvantaged background and that has been my motivation to change our circumstances as a family,” Nkayi said. He said he was very excited to be accepted to study towards medicine at the University of Cape Town this year. “I have always wanted to study medicine. This has been a dream come true for me and I am very happy to finally realise my dream. I love medicine,” he said. “My secret was to make sure that I used whatever little time I had to study. I did nothing else with my spare time except to study hard. I would wake up at 2am to go study until I am satisfied that I have understood all that I was studying on that particular subject,” Nkayi said. “I could not believe that my achievement was at that level that it could be recognised not only in the province but nationally as well. For me that was the highlight. I simple could not believe it. I am very excited and happy and thank my mother and the entire family and teachers from my school for supporting me through all of this. I would not have done it without them,” he said. Siyabulela Fobosi, a public service accountability monitor education researcher based at Rhodes University, said it was important to recognise that the focus on the national pass rate often obscures significant differences in provincial achievements and the divisions between urban and rural areas. 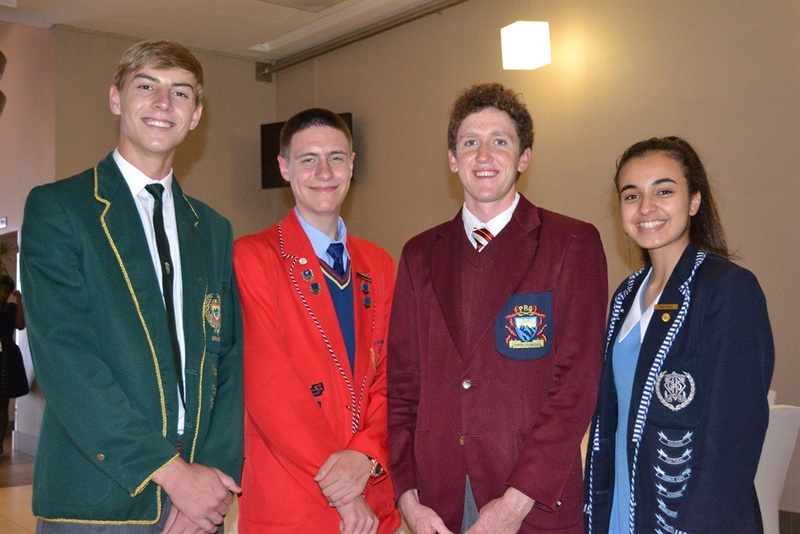 If the graduating pupils of 2019 are to outperform their 2018 matric counterparts, their parents and guardians are going to have to become more involved in their education. A good start would be for parents to refrain from making statements such as “I do not know the subject” or “I am not educated” when their children want help with their homework. Other oft-repeated statements that are a no-no, according to a list of guidelines from the National Education Collaboration Trust, include: “I work long hours”; “I am tired when I come home”; “Teachers are paid to do it”; and “I was a failure at school”. The trust aims to strengthen partnerships between civil society and government to achieve the country’s education goals. It is chaired by corporate heavyweight Sizwe Nxasana, and the trustees are drawn from stakeholders in business, government, education, labour and civil society. The trust was established in 2013 in response to the National Development Plan’s requirement for increased collaboration to improve educational outcomes. One of its goals is for 90% of the country’s pupils to pass mathematics, science and languages with at least 50% by 2030. The guidelines for parents and guardians were compiled by the department of basic education in consultation with experts, and are intended to get them more involved so that their children can reach their full potential. Develop a daily reading routine by using whatever electronic gadgets you have, or can afford to have, for the purpose of reading. Downloading books on iPads, making magazines and books available at home, and encouraging children to join the local library are just some of the ways parents can help. City Press also spoke to experts about what parents can do ahead of the new academic year, which begins on Wednesday. According to Ruksana Osman, professor of education at the University of the Witwatersrand, parents or caregivers are the “ones who help provide a structure and a system for working on schoolwork in a disciplined and consistent way”. Parents, she says, need to ensure that their children have the emotional and physical support they need to succeed. “This can take the form of being interested in the child’s schoolwork and in their progress, and in ensuring that the child knows that he or she enjoys parental support. “Also, parents and caregivers must be in regular contact with the school. The school [and] home partnership is vital for the pupil’s success,” Osman said. Johannesburg-based clinical psychologist Vuyo Temba says parents need to show interest in their children and in what they do. Temba says showing an interest involves asking children not only about how their day at school was, but also about other aspects of their lives. “Ask them about their interests, even if they seem different from yours. This tells them that ‘my parent accepts me as I am, even when I am not like them’. She also recommends that parents work with their children to set up rules of behaviour. This works well with teenagers, who can be held accountable for the rules they helped create. Temba warns against parents shaming a child – rather focus on building their self-worth and value, and do not compare them to others, especially siblings. Crucially, she adds, parents should allow children to fail. Read all the latest news in the December PSAM newsletter. The newsletter includes articles from PSAM staff and partners, information about events and conferences attended by PSAM staff, and ongoing initiatives within the organisation. 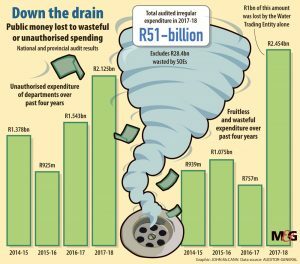 The AG said there were many municipalities where irregular expenditure had not been investigated, which has led to a culture of noncompliance and no consequences. The Public Service Accountability Monitor produced an expenditure tracking report, interrogating expenditure in programme five of early childhood development of the Eastern Cape department of education from the 2016-17 financial year to the 2017-18 financial year. The report also tracked 201718 spending and performance of the early childhood development (ECD) grant of the department of social development. The department of basic education (DBE) and department of social development (DSD) continues to work together in expanding ECD. ECD prepares children for school and is, therefore, important for the learning and development of children. In December 2015, cabinet approved the ECD policy, with the intention to finalise implementation of the policy by March 2018. 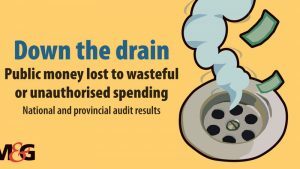 Key to the findings of the tracking report is the underspending in programme 5 of the Eastern Cape department of education (ECDoE) by 23%, which is R130.49m of R580.48m, spending R449.98m in 2016-17; and 16%, which is R92.80m of R588.46m, spending R495.65m in 2017-18. While the underspending decreased from 23% in 2016-17 to 16% in 2017-18, it is not good for ensuring quality ECD access for children – especially, considering the poor performance related to the training of ECD practitioners. According to the ECDoE 2017-18 annual report, the main reasons for this underspending relate to the appointment of professionally qualified practitioners into mainstream schooling. The training of ECD practitioners started late in the 2017-18 financial year and, as a result, payments for bursaries could not be made. The department failed to meet its own target of 959 grade R practitioners with NQF level 6 and above qualification, and only managed to achieve 878. This means the department underperformed by 81 because of practitioners who did not successfully complete all the modules for a diploma in grade R teaching, including students who dropped out of the course. 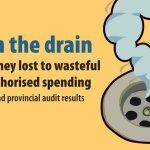 Similar to the underspending for ECD by the ECDoE between the 2016-17 and 2017-18 financial years, in 2017-18 the Eastern Cape department of social development (ECDSD), only spent 48.6% (R27.2m) of R56.4m of the ECD grant, because of late appointment of service providers. This means service providers for upgrading and maintaining ECD centres were not appointed on time. As a result, the ECDSD failed to meet all its targets for ECD maintenance. For example, through the maintenance component of the ECD grant, the ECDSD targeted 96 ECD centres for upgrading, but none benefited. While R10.2m was allocated for the maintenance of these centres, the ECDSD failed to spend this money. The failure to spend money and meet targets relate to delays internally because of capacity constraints for administering the maintenance component. The underspending and poor performance constitutes an affront to equitable access to quality ECD in SA. ● The ECDoE should make plans to provide training to grade R practitioners, ensuring children are taught by qualified educators. ● The provincial treasuries should provide financial management support to departments in order to better manage resources, as outlined in section 18(2) (e) of the Public Finance Management Act (PFMA) 1 of 1999, that a provincial treasury “may assist provincial departments and provincial public entities in building their capacity for efficient, effective and transparent financial management”. ● The internal CFO and strategic planning of the ECDSD should support the department in order to improve performance in the ECD grant implementation in the short- to medium-term.